Ecommerce businesses have a lot of different factors at play, but the huge advantage that they have is that everything is online. Creating an all-in-one ecommerce dashboard for your business allows you to take advantage of all that online data by assembling everything in one single place. No need to go back and forth from one platform to the other: watch your sales’ growth, store’s performance, product’s analytics, and get valuable insights on your customers’ behavior in one simple, slick, and customized ecommerce dashboard. Automatically gathering your ecommerce data in a single dashboard for ecommerce will allow you to understand your product volume and profitability by channel and device at a glance, all the while saving you a ton of time so you can work on improving your ecommerce strategy. Keep track of the products your customers tend to purchase together, the number of items per transaction, and unique purchases, and use this precious insight to advertise your products in ways that will make your average order value reach skyrocketing new heights. Cha ching! Your ecommerce business uses a wide range of marketing platforms, from analytics to SEO to email… and everything in between! With DashThis, you can connect your ecommerce dashboard to over 30 integrations, including Google Analytics, Ahrefs, MailChimp, Google AdWords, Facebook Ads, Moz, Instagram. Plus, our simple CSV file manager enables you to connect your own custom data as well, and it will even update itself automatically… just like any other integration would! Although we aren’t the only ecommerce dashboard software out there, we’re a pretty unique one. A far cry from those big business intelligence tools, we’re known for two things: being one of the easiest tools to use, and having the best customer service in the industry. And in a world of endless automation and increasingly complex technologies, it’s a huge advantage to be user-friendly; both as a tool and as people. Don’t believe us? Check out what they’ve got to say! 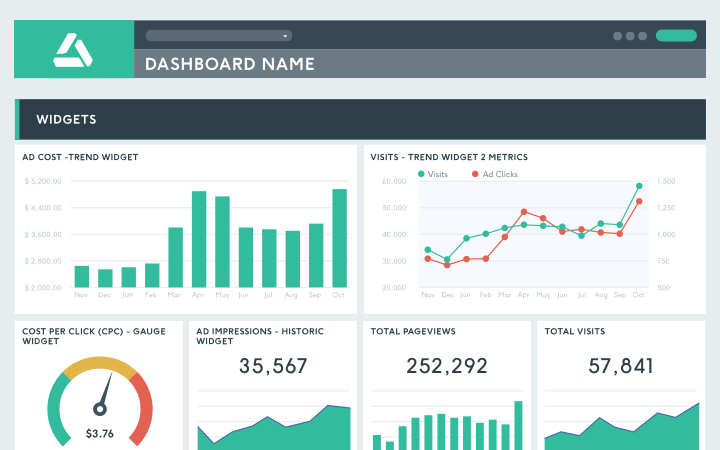 Creating an ecommerce dashboard doesn’t need to be a complicated process. In fact, we’re convinced it shouldn’t be. This is why we provide you with the features you’ll need to make the most of your ecommerce dashboard experience: use a preset ecommerce dashboard template to help you get started, customize your widgets to showcase the exact data you want, add your own logo, schedule automatic email dispatch, and so much more! Nobody likes paying for things they don’t need. This is why here at DashThis, our pricing model is based on the number of ecommerce dashboards you want. And since we don’t like to play favourites with our clients, everything else (yes, literally EVERYTHING) is included, including your very own personal account manager who does his/her best to make your DashThis experience as awesome as possible! Get your own personalized URL to reflect your or your client’s brand, such as dashboard.yourcompany.com. Trust our amazing designers with a fully custom design for your dashboard to fit your ecommerce business! Save on a custom URL and design with a white label bundle that includes both! An ecommerce dashboard just the way you want! Get more ecommerce content on our blog! If you’re as passionate as we are about ecommerce & analytics, our blog is definitely where you wanna be right now! And while you’re at it, our newsletter is also something we promise you don’t want to miss out on!